I love Chinese food. It’s funny really. When I was very young, under age 6, I apparently would eat Chop Suey all the time. Then something happened and from age 6 to age 20 I refused to eat anything at a Chinese restaurant. We would literally go out to eat and all I would eat is a dish of pineapple and a few crispy noodles. I have no idea why I didn’t want to eat Chinese food but I didn’t. Then in college I finally decided to give in and try some Sweet and Sour Chicken. I was shocked when I really liked it! 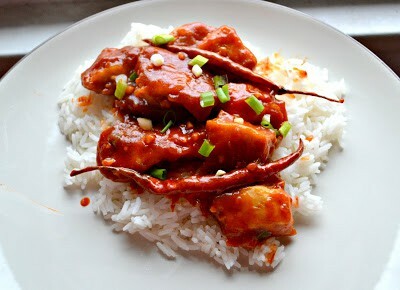 Next on the list was General Tso’s Chicken which is still one of my favorites. Soon I was eating Chinese food several times a month. 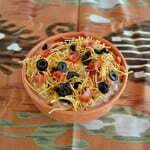 It’s now one of my favorite ethnic cuisines and my husband says it the one I cook the best. I tend to agree which still makes me smile. One thing I don’t order very often, but that I really love, are crab rangoons. I love how crispy they are and the taste of the cheese and crab on the inside. It’s really delicious but I know they carry heavy calories because they are deep fried. I decided I needed to try making them myself since my last Chinese food feat, making eggrolls, went so well. These weren’t hard to make though frying them was a challenge. While both Frank and I liked them, we both agreed that next time I’m either going to skip the imitation crab or use the real thing. 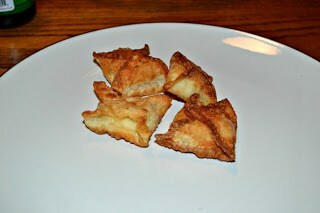 The rangoons were crisp on the outside and had the warm, creamy cheese inside with just a hint of crab. We had them as an appetizer for chili lime tofu night but these would be a snack during football season! 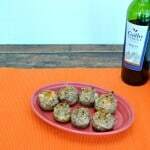 #SundaySupper is having a tailgating party this week and I’m happy to share these with the group. I can definitely see myself frying these up during halftime of a Steelers game. Let’s goooooooooooooo Steelers! 1. 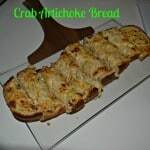 In a small bowl combine the crab meat, cream cheese, garlic cloves, and green onions. 2. 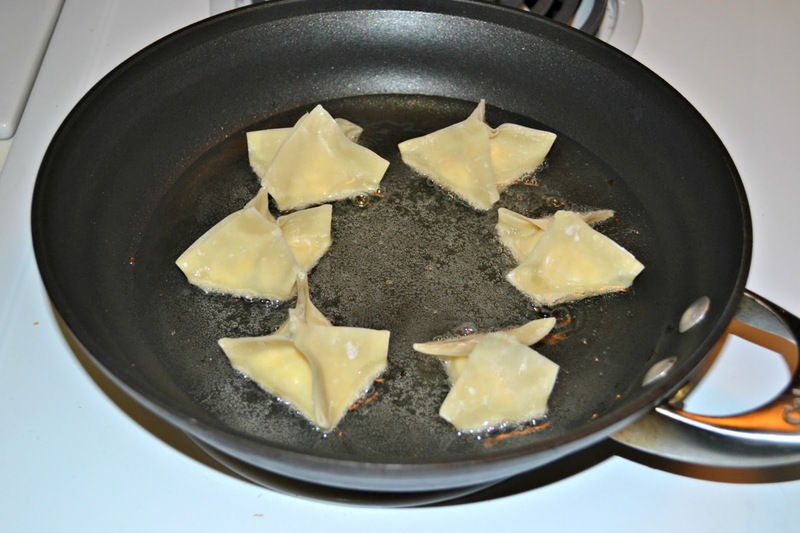 Lay out wontons on the counter. Place 1-2 teaspoons of the cream cheese mixture in the center of each one. 3. Brush water along all 4 edges of the wonton wrappers. Take two opposite ends and pinch together. Take the other two ends and pinch together, then pinch all 4 ends together. Repeat with remaining wrappers. 4. Heat 2 inches of oil in a frying pan over medium high heat. Drop a few at a time into the oil. Fry for 1-2 minutes per side or until golden brown. Remove from the oil with a slotted spoon and place on a plate lined with paper towels. Repeat with remaining crab rangoons. 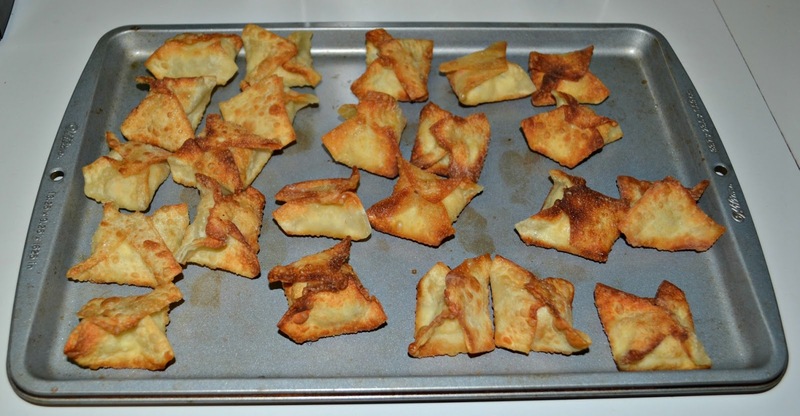 I love crab rangoons and really I never thought to make them at home. How silly, because they look so easy. Steeler Nation represent!!! 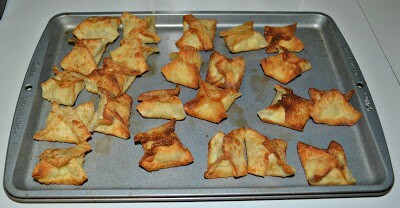 I love crab rangoons and these look amazing. I will have to give these a try sometime. LOVE it! Yum! I wouldn’t mind nibbling on a plate of these! I love Crab Rangoons but have never made them at home. What a great recipe! I’ve always wanted to make crab rangoons at home. What a great recipe! Could you pass that plate over here please? Love me some rangoons! Crab Rangoons are definitely a treat, but I’m with you I really would prefer them with the real crab! I love those things, Heather! Yours look perfectly crispy and delicious. 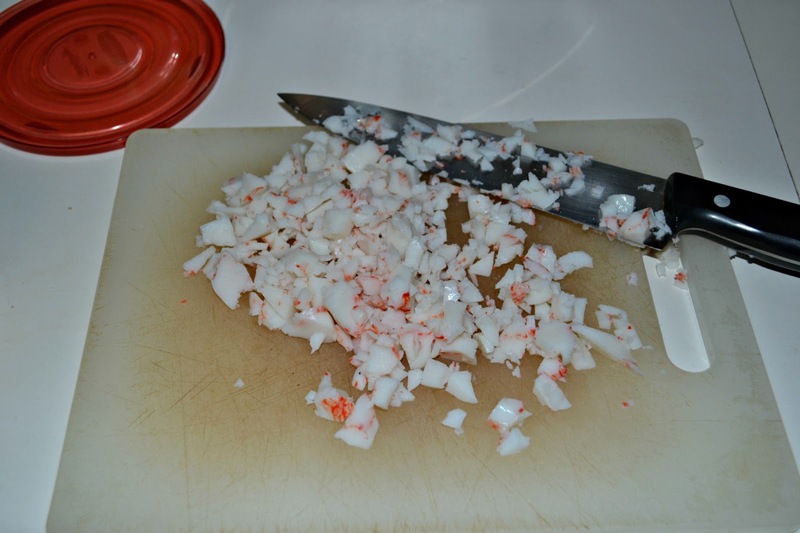 If you can’t get real crab meat, shrimp are also excellent in them. This is one of those things that makes me know I could never give up fried foods entirely. 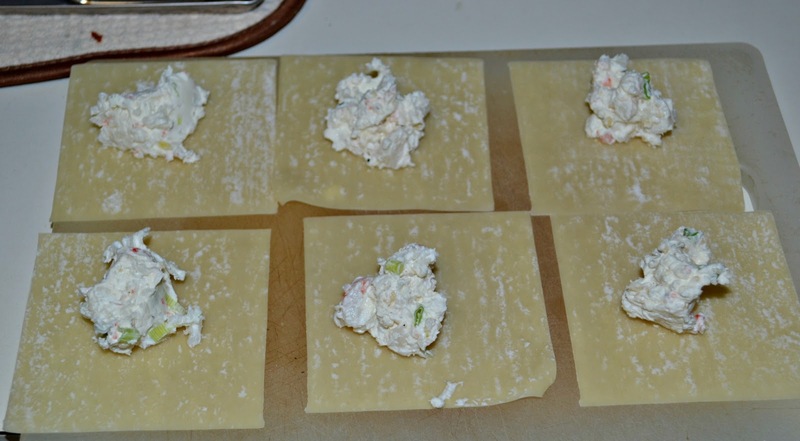 Crab, cream cheese, and that crunchy wonton. Oh heavens. Oh my gosh! I love these things! I always pile them on at the restaurant! Can’t wait to make them myself! I knew we were friends for a reason 😉 Go Steelers and crab rangoons! I love crab rangoons but rarely get them for the same reason (and the money). I have never had crab rangoon and am so thrilled that you enlightened me. They look great! I love Chinese food, but have rarely made it at home. I may just have to try these. I used to love Chinese food too, well, I still do, but it’s so salty that I rarely eat it. I definitely want to make some at home because then I can control the ingredients. I have had crab rangoon once and loved them. I remember the day I discovered chinese too! I don’t like crab, but last night I had a very similar turnover with almost the same filling except for bacon instead of the crab. Great choice for tailgating Heather! I love (and also sort of hate) how our taste buds change, often for no explicable reason. I went through an 8 year phase where I didn’t like bacon OR pie. It was so weird. I’m glad you’re back to the Chinese food loving world. These rangoons are just too cute and delicious-looking. Just like everyone else here, I LOVE, LOVE, LOVE crab rangoons. I actually can almost taste them from looking at your post and seeing your photos. I think I’ll have to add them to my ” need to make recipe wish list” for the upcoming months. My husband was just talking about making some of these for me. I will share this recipe with him.